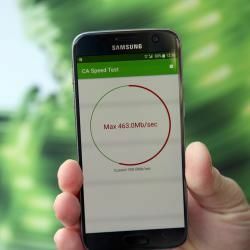 The Austrian subsidiary of Telekom Austria Group, A1, and its technology partner Nokia presented a major step in the evolution toward fifth generation mobile communications by transmitting 513 megabits per second over the A1 live network on a mobile router and 463 Mbit/s on a smartphone at the University of Klagenfurt. Triple carrier aggregation was used for the first time for the transmission: Frequencies in the 2.6 GHz, 1800 MHz and 800 MHz ranges were bundled and combined with the complex modulation process 256 QAM. This makes it possible to achieve significantly higher bandwidths than with the widespread LTE standard. "The use of different frequency bands that span a wide section of radio spectrum is also very important for 5G transmission speeds. A1 has an excellent frequency spectrum here and is already optimally prepared for the new generation of mobile communications", said A1 CTO Marcus Grausam. "In Austria we will already be making selective use of triple carrier aggregation in 2017. As soon as there are sufficient end devices on the market, we will use the technology in those areas where especially large volumes of capacity are needed in the network - above all in urban areas. Carrier aggregation will also play a major role in 5G, the new generation of mobile communications, as it provides the technical basis for high bandwidths and the efficient use of the available frequency bands. "In mobile communications LTE or 4G forms the basis for the future communication standard 5G and will be continuously further developed accordingly. What we saw today was a preliminary stage of 5G", said Peter Wukowits, Nokia Country Manager Austria and Head of the Customer Business Team Central Europe. "In further steps we will also see even greater bandwidths up into the gigabit range, higher capacities and denser networks and fewer transmission delays. The foundations have already been laid in the laboratory and the technology will now be coming to the live networks. Nokia is a leader in the development of 5G and as an innovation partner we are delighted to be taking this forward with A1." 5G builds upon 4G technology. However, before the new generation of mobile communications can be taken into service, a number of evolutionary steps will have to be completed so that more characteristics such as higher bandwidths and the technical prerequisites for 5G can be gradually implemented. This will enable the introduction of more and more new services, for example in the Internet of Things or for Smart Cities. The 5G-standard is anticipated for 2019. The expectation today is that implementation will begin in 2020. The Telekom Austria Group, the international holding company with A1 as the Austrian operator, is a member of the Next Generation Mobile Networks Alliance (NGMN) so that it can play an active role in the standardization of 5G networks. The NGMN is an international alliance of operators, manufacturers and research institutes that promotes and guides the development of future mobile broadband technologies with a particular focus on 5G.